To access high resolution photos, video news releases and highlights, click here. To view schedule and heats for November 24, click here. 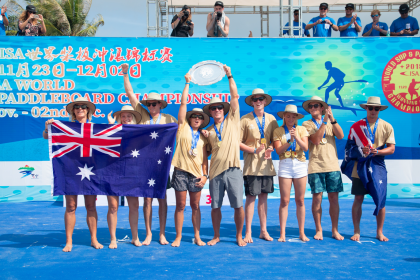 The 2018 ISA World SUP and Paddleboard Championship is officially underway, set to crown the event’s first-ever SUP and Paddleboard World Champions in Asia. 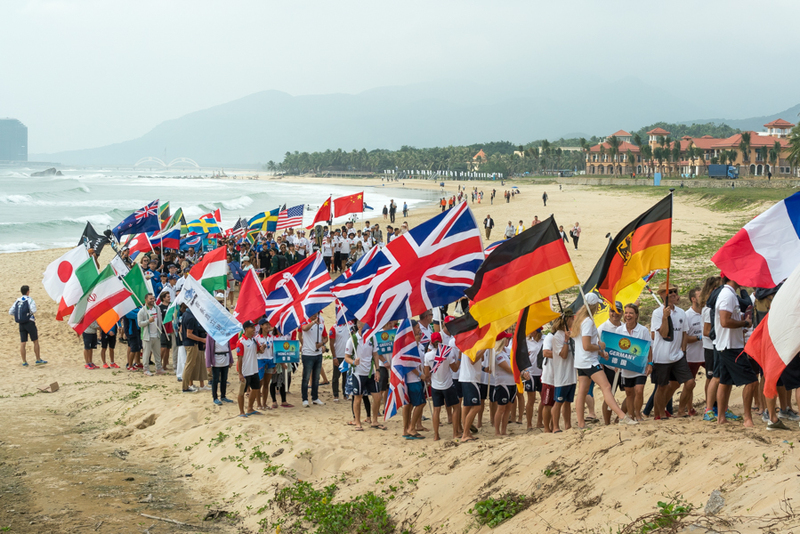 Nearly 200 athletes from 26 nations around the globe participated in the Opening Ceremony at Riyue Bay on Friday, inaugurating the competition with the ISA’s unique Parade of Nations and Sands of the World Ceremony. 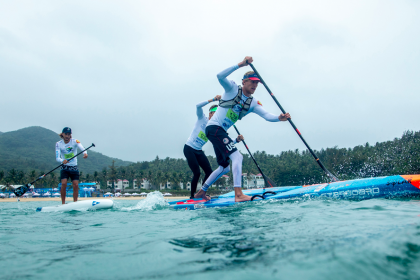 The competition kicked off in the afternoon with the Men’s SUP Surfing, providing an exciting start to the event in chest to head high waves at the renowned left point break of Riyue Bay. USA’s two-time SUP Surfing Gold Medalist Sean Poynter was the standout of the day, earning the highest wave score (9.43) and highest heat total (17.60). 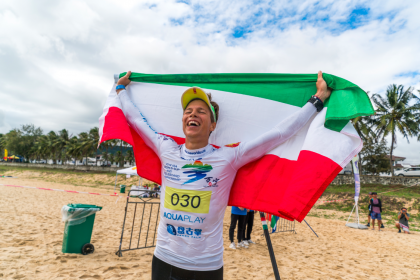 Brazil’s Luiz Diniz, the defending Gold Medalist, also was a top performer, following Poynter’s heat total with the second highest of the day, 17.30. 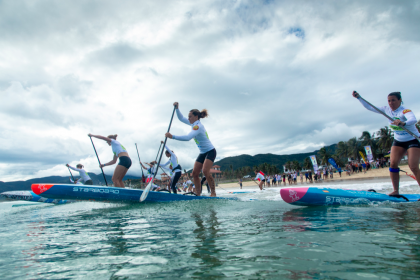 “The world is here united through the sports of SUP and Paddleboard,” said ISA President Fernando Aguerre. 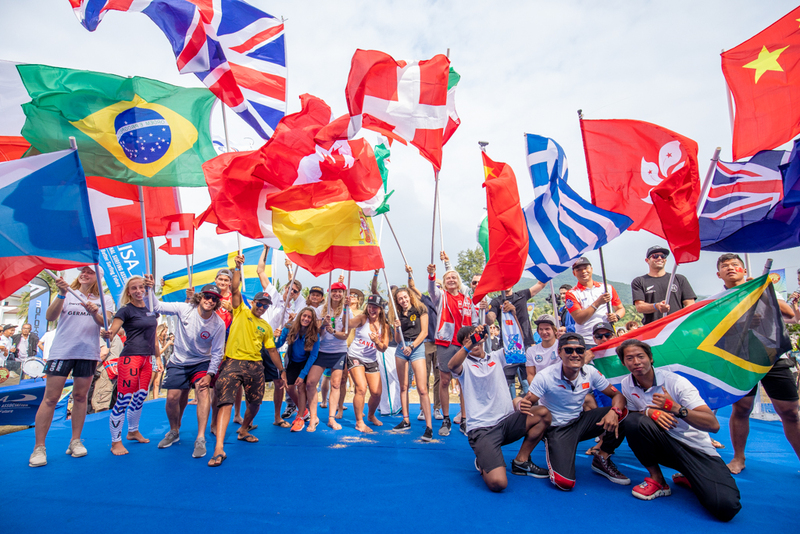 “The Opening Ceremony is a special moment that these athletes will remember for the rest of their lives, the pinnacle of representing their nations in competition. 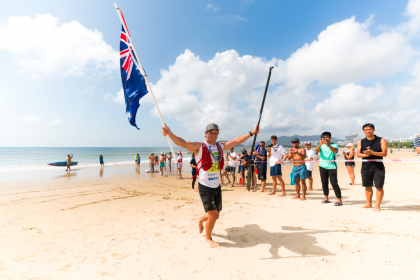 “The ISA is the only International Federation that has ever run World Championships for SUP, and bringing this event to Asia for the first time highlights the global accessibility and appeal for the sport. SUP can be practiced on any body of water. The festive Parade of Nations commenced the day’s activities as the national delegations paraded down the beach at Riyue Bay in displays of national pride. The parade arrived at the Opening Ceremony stage, where the athletes were greeted by dignitaries that included ISA Executive Committee Member, Atsushi Sakai, ISA Executive Director, Robert Fasulo, Chairman of the Water Sports Management Center of General Sport Bureau of China, Li Ruili, Vice Director of the Department of Tourism and Culture and Sports of Hainan, Gao Yuanyi, Secretary of Wanning, Zhang Meiwen, and Mayor of Wanning, Zhou Goaming. Following the parade, the ISA celebrated its signature Sands of the World Ceremony in which two members from each team took to the stage and poured sand from their local beach into a glass container while waving their national flag, symbolizing the peaceful gathering of nations of the world through Surfing. To give the visiting national teams a taste of the local culture of Wanning, the competitors and spectators were treated to a traditional Chinese martial arts Wu Shu display and a local Bamboo Dance performance. 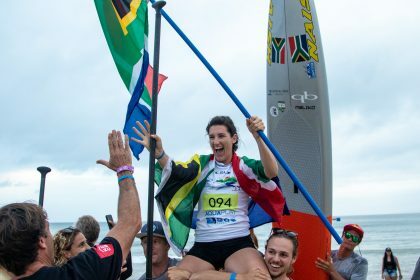 The ISA World SUP and Paddleboard Championship will be streamed live on www.isasurf.org Nov 23 – Dec 2. *All times in local time (GMT +8). Schedule subject to change.